South Florida Theatre Scene: The SENTINEL and the POST: Back In the Game? In last week's Mondays are Dark, we complained that the stage section of the Fort Lauderdale Sun-Sentinel had become a pathetic joke. 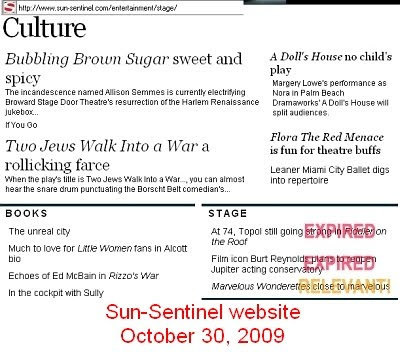 Out of the six stories available, four of them were hopelessly out of date, the Wondrettes review was a re-print from the Miami Herald, leaving Rod Hagwood's stiltingly-written account of Flora, the Red Menace as the only topical theatre article from the Sun-Sentinel on their website. Well, first they purged most of the old articles, but we didn't get around to writing about it. Then, miraculously, new articles and reviews started appearing, and none of them were from Hagwood! In fact, they were written by someone who knows more than a little about theatre, Bill Hirschman. Still a couple of old articles taking up space - guess they think those stanky stale articles have merit because they feature celebrities - but five of seven articles are reviews for shows that are still playing, and three of those reviews were written in the last week. So, the good news: the Sun-Sentinel has cleaned up its culture page, and is paying a professional theatre reviewer for well-written reviews. The bad news: weell, those reviews show obvious signs of butchery. Whoever is editing is wielding a cleaver and leaving gaping holes in the reviews. It's heavy-handed, and obvious to the Theatre Scene that the Sun Sentinel still needs to hire a decent editor or two. But at least it's Bill Hirschman, and we're getting stories at a pace commensurate with production. We'd move on to the Palm Beach Post, but they, too, have suddenly started producing theatre stories again: for the first time in over a year, Hap Erstein's byline is appearing over theatre reviews and stories at the Post. Five articles in the last week, which is the most theatre coverage seen at the Post in that span since he left. Be sure to visit the sites, and to leave positive comments about the improvements.